If that is what is said about a picture, then an infinity of words can be found from the Library of Congress who now has a Flickr account. From within their vast collection of American History, many archived pictures of our past are now accessible for all. 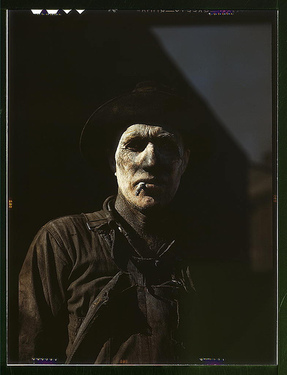 This is a very powerful and haunting image of a worker at a Carbon Black Plant in Sunray, Texas. The picture was taken in 1944 by John Vachon. The subject is unknown. The image leaves me a bit speechless and wanting to know the story behind the picture. How long did this man live. Did he have a son that served in WWII which was in full throttle? I am always intrigued by historic images. "Who's Sheila Drummond?," you're probably wondering. She's a golfer. She's also a golfer who recently hit a hole-in-one. She's also a golfer who hit a hole-in-one in the rain. Oh, and she's also blind. Diabetes took Ms. Drummond's sight about 30 years ago, and she's been playing golf for the last 15 years. The governing body for blind golf believes she's the first completely blind female to pull off the hole-in-one. What probably helped her was that it was only the fourth hole, so the beer probably hadn't taken over yet. Still, that's one amazing feat, and she's obviously one amazing lady. Read more HERE. Father's Day is now center stage in my mind for this Sunday. Every year I struggle to get the card and avoid being a johnny come lately. For my family, Hallmark makes a fortune. With our extended family, they should offer a quantity discount. The other thing is gifts. What do you buy a man that owns every tool known to man. My dad is a fisherman as well but he has a dozen of everything. Go figure. Here are some unique gift ideas for Dad. Click on the links to for more info. For more idea, click HERE. 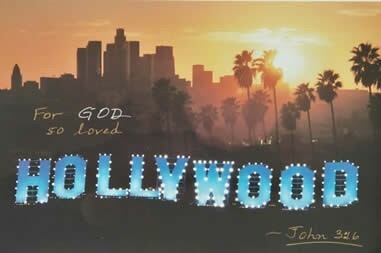 The Hollywood Prayer Network is a strategic prayer network for the Hollywood Entertainment Industry. "Ultimately, we want to see a revival in Hollywood and we believe it must begin with prayer. We also believe this will only happen by facilitating a global prayer ministry where Christians acknowledge Hollywood as the world’s most influential mission field and pray for the people in the Entertainment Industry. We also are committed to have every Christian professional in Hollywood prayed for as a “tent-maker” by an intercessor outside of our workplace. If we are going to see change in people, one at a time, from the inside out, it must start with the love of Jesus and the prayers of His people. For with prayer for Hollywood comes cultural revival." Tired of waking up and having to wait for your morning java to brew? Are you one of those groggy early morning types that just needs that extra kick? 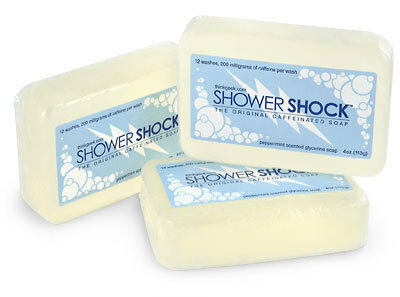 Introducing Shower Shock, the original and world's first caffeinated soap - the ultimate clean buzz. 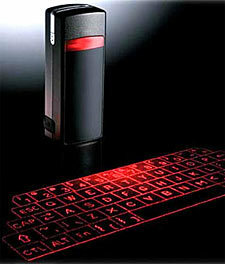 This tiny device laser-projects a keyboard on any flat surface... you can then type away accompanied by simulated key click sounds. Use it to compose an e-mail on your bluetooth enabled PDA or Cell Phone. With 63 keys and and full size QWERTY layout the Laser Virtual Keyboard can approach typing speeds of a standard keyboard... in a size a little larger than a matchbook. Click HERE. It's called a laptop but rarely resides in the lap because of the heat. So I've got the computer on a pillow or on the side... gotta protect yourself. Now there's a better solution. Check out LapDawg. Apart from the goofy pics on the site, I think I might. But at some point we gotta turn the thing off and live a little, don't we? Once you've lived in a town for awhile the inevitable happens.. your mind goes comatose when deciding where to go for lunch! There could be hundreds of great places to eat and you can't think of one. 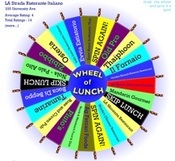 Wheel of Lunch is a cool creation by Jim Bumgardner of `Yahoo! Local. Just key in your zip code and spin the wheel. Spin HERE.